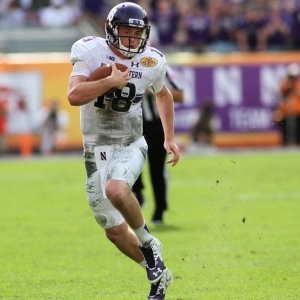 Pat Fitzgerald, entering his 12th season at Northwestern, is widely praised and respected. I'm not entirely sure I understand it. I get that Northwestern isn't a top-tier school on par with Michigan or Ohio State in the Big Ten, but they are on the outskirts of one of the great cities of the world, they have a fancy new practice facility under construction, and they should just plain be better than they are. And Fitzgerald should have more success, too - he has won seven or fewer games in seven of his 11 seasons, including last year. Northwestern as a program seems far more content with mediocrity than they should be, and surely I am not the only one who is frustrated by that. I get that Fitzgerald is doing relatively well - he has made more bowl appearances with the team than they had previously made in their entire existence. I just don't think is enough of an excuse for the bar to be as low as it is. The season last year was as mediocre as we have come to expect. It started out rough. They had a reasonably acceptable loss to Western Michigan to start the season and then a wildly unacceptable loss to FCS also-ran Illinois State. After beating Duke they lost again to Nebraska to open Big Ten play. That dropped them to 1-3, so their season was functionally over before it had even gotten rolling. They got a couple of decent road wins at Michigan State and Iowa, and beat Indiana, but then they lost at Ohio State and to Wisconsin to fall closer to postseason peril. The schedule was on their side, though, as wins over lousy Purdue and Illinois moved them to the magic six-win barrier. They drew Pitt in the Pinstripe Bowl, and in a reasonably surprising result they won by a touchdown. It was a fairly disappointing season salvaged only by the number of bad teams they played. They have a lot of returning players up front. QB Clayton Thorson is back for a third year as starter. So is starting running back Justin Jackson. Both got much stronger as the season went along last year, so there is hope they can keep the momentum rolling. They join five returning starting linemen, as well as Georgia Tech transfer Trey Klock, who also has starting experience. They return three of the four top receivers, too. Austin Carr is a huge loss, but they add grad transfer Jalen Brown from Oregon. He was a very-highly-regarded recruit who struggled to find his way at Oregon, but then Oregon hasn't exactly been kind to receivers lately. The offense was below average last year but has a chance to be improved this year just because of experience. Defensively they have suffered a couple of big losses in the front seven as their two best defensive players - linebacker Anthony Walker Jr. and defensive end Ifeadi Odenigbo - were drafted. They returned six of eight linemen with experience, though, so they should be relatively okay there. The linebackers are more of a concern, with Walker being joined by two other departing players. They will need some younger, less-experienced guys to step up if they want to avoid problems there. The best news defensively, though, is that they return both starting safeties and three cornerbacks who have started. They were an excellent team against the run last year that was quite poor against the pass. They will need to find answers in those front seven positions or they will decline against the run, and that will have real impact on the team. The season should start off stronger than it did last year. Nevada and Bowling Green will be outmatched, and in between they have a trip to Duke that is very manageable. A record of 3-0 is in play, But then they travel to Wisconsin, so any unbeaten streak will end. Then they host Penn State, so it looks a lot like 3-2. The news is pretty decent the rest of the way in Big Ten play, though. They avoid both Michigan and Ohio State, and the only game they aren't well positioned to win at this point is a trip to Nebraska - and even that one is a tossup at this point because Nebraska is breaking in a new QB and a lot of young players. The team's ceiling this year is 10 wins, but their floor is likely only seven or eight if they can address some of their issues from last year. So they are well on track to improve from last season. The Wildcats are not one of the 36 teams for which BetOnline has listed national title odds. That's justified - even in the very best of circumstances this is nothing like a national contender. In the Big Ten they are tied with Nebraska as the fifth choice to win at +2000. That seems fair enough, though they are so far behind the top four teams in the conference that they might as well be playing a different sport. The team was a better team to bet than to cheer for last year. They were a solid 8-5 ATS, which is nicely profitable, and were 7-2 ATS in their last nine after that ugly start. They were even better on the total, going "under" in nine of 13. I'm not particularly high on Northwestern as a program as I am sure you can tell. Despite that, though, things could really fall into place for them this year. There are two sure losses, and a couple other tough games, but they should be well positioned to win nine games if they are any good. I don't see them winning their division unless Wisconsin really falls apart, but at least according to the scoreboard they should be a better team - largely due to their experience.